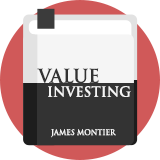 James Montier Trinity of Risk is a short selling strategy that uses rules suggested by economist and equity strategist James Montier, who wrote Value Investing. He based the approach on three risk factors highlighted by value investor Benjamin Graham: Valuation Risk, Earnings Risk and Financial Risk. It identifies companies that could be overvalued, have poor quality earnings and might be financially distressed. Specifically it uses the Graham & Dodd price-to-earnings ratio and looks for companies that are reporting exceptionally high earnings growth but fail the Altman Z Score of balance sheet risk. James Montier wrote: "Risk isn't a number, it is a concept or a notion? Rather than running around obsessing on the pseudoscience of risk management, investors should concentrate on understanding the nature of this trinity of risks." Short selling shares can be very risky but the Trinity of Risk can still be used as an indicator of which stocks should be avoided.